The Equal Future 2018 Campaign said today that elements of the Pope’s revised advice to parents of children who may be LGBT following the launch of their campaign in Dublin last week have the potential to be transformational for children around the world. The Campaign is calling on all people to have their voices heard in the lead-up to the Catholic Church’s Synod on Young People this October. ‘Don’t condemn, [but] dialogue, understand, make space for the son or daughter… so they can express themselves,’ the Pope has advised. He also definitively instructed Catholics not to ‘throw their child out of the family’, but rather to accept that ‘You are my son, you are my daughter, just as you are’. Tiernan Brady, Campaign Director for Equal Future 2018, said “What we see here is the Pope finally acknowledging the damage that is done to children. The challenge for the Catholic Church and for society, once we accept that damage is being done, is how to stop it. This new advice that all children and young people must be accepted for who they are, that none may be condemned or driven out of the family, and that all must be ‘given space to express themselves,’ is positive. “However, it falls well short of protecting children from the damage done by LGBT stigma. We now need the forthcoming Synod on Young People to consider and address the damage done to children and young people when they are made to feel that to be LGBT would be a misfortune or a disappointment, and to consider the role of the Church’s own teaching on LGBT in that. The Campaign has developed a website where people can tell their story directly to their local delegates to the Synod and is calling on people everywhere to go to https://write.equalfuture2018.com/ to express their view and make sure their voices are heard. 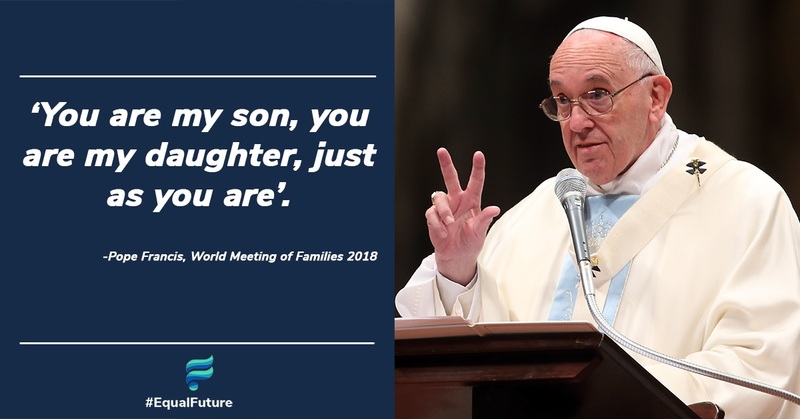 The Equal Future 2018 Campaign launched at the World Meeting of Families in Dublin on 22nd August, four days before the Pope’s comments were made to journalists at the end of his visit there. It is supported by the largest ever coalition of LGBT and progressive religious groups. The https://equalfuture2018.com/ website includes an online platform where people can identify and contact their local delegate to the forthcoming Synod on Young People to express their views. Equal Future 2018, which launched in Dublin on 22nd August ahead of the Pope’s visit there, raises awareness of the damage done to children when they are given the sense that to be LGBT would be a misfortune or a disappointment and seeks to change behaviour as a result of that awareness. It also suggests taking advantage of a unique moment in the Catholic Church’s history through the invitation the Church has made to give feedback to bishops ahead of the Synod on Young People in Rome this October. The Synod will consider ‘situations where young people are excluded for social or religious reasons’. The Campaign asks people to share their stories with the delegates at the Synod through the https://equalfuture2018.com/ website. Comments attributed to the Pope were extracted from an interview given to journalists during an inflight press conference from Dublin to Rome after the World Meeting of Families. You can read the full, revised transcript of the interview from the Vatican website (in Italian): https://w2.vatican.va/content/francesco/it/speeches/2018/august/documents/papa-francesco_20180826_irlanda-voloritorno.html.